The Satellite Data Analysis and UTLS Group in ACOM focuses on studies of global scale chemical behavior using satellite measurements, aircraft campaigns, meteorological data sets and model simulations. 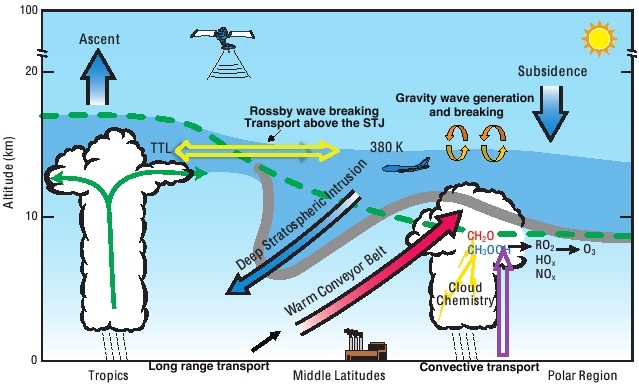 Recent work has focused on understanding the chemical and dynamical behavior of the tropopause region, and its long-term variability, to help quantify processes which contribute to coupling in the upper troposphere - lower stratosphere (UTLS). Dynamics, chemistry, and microphysics in the TTL using satellite and aircraft data. UTLS transport studies including transport in the Asian monsoon and North American monsoon regions. Thermal variability an dtmperature trends in the lower stratosphere using satellite data. Imporving cloud processes in global models using airborne campaign observations.